Notre Dame will go head to head with Stanford on and off the gridiron this weekend, as the Irish are set to host recruits considering both schools, according to Irish recruiting analyst Tom Loy. 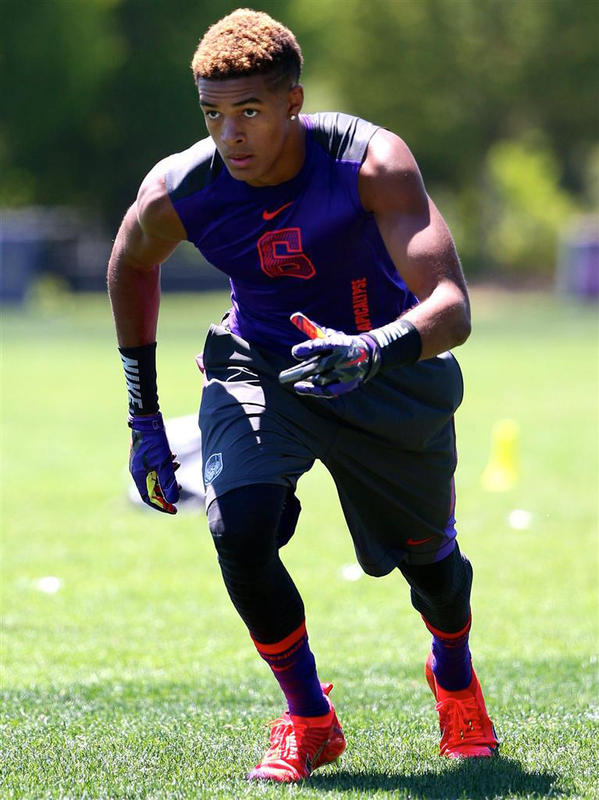 Class of 2015 receiver Equanimeous St. Brown headlines the group of roughly 15 prospects visiting campus for Notre Dame’s first true home game in four weeks. St. Brown, the No. 9 receiver and the No. 96 overall player in the country according to 247Sports’ Composite Rankings, is considering Notre Dame, Stanford and USC, among other schools, Loy said. “He’s been a top target for this Irish coaching staff and a guy that [Irish offensive coordinator and wide receivers coach Mike] Denbrock has wanted for a very long time,” said Loy, who covers Notre Dame recruiting for Blue and Gold Illustrated, part of the 247Sports network. At 6-foot-5, 205 pounds, St. Brown is bigger than current class of 2015 Irish receiver commitments C.J. Sanders (5-foot-9) and Jalen Guyton (6-foot-1), and he has a higher ranking than 6-foot-4 receiver commit Miles Boykin. “He’d be a big pickup for both Mike Denbrock on the recruiting trail and also for [Irish head coach] Brian Kelly because he’s going to be that tall, physical target that could pay off in a big way down the road,” Loy said. Class of 2015 defensive back Frank Buncom IV, who received an Irish offer during the bye week, also is expected on an official visit, Loy said. Buncom IV is considering Notre Dame and Stanford, as well as other high-level academic schools like Duke and Vanderbilt. Loy said it’s shaping up to be a “Notre Dame-Stanford battle” for the No. 123 player in the country, whom the Irish are recruiting as a safety. Class of 2015 safety Calvin Brewton, a Florida State commitment since January, will take an official visit to South Bend this weekend, Loy said. Brewton is slotted as the No. 17 safety and the No. 289 overall player in the country, per 247Sports’ Composite Rankings. “It’s tough to see the Irish being able to flip him,” Loy said. Loy, however, said there are benefits to landing visits even if the players are long shots to pledge to the Irish. “Just getting a guy like Brewton on campus, that’s a win for Notre Dame because that sends volumes throughout the country on the national recruiting scene,” Loy said. In addition to Brewton, defensive end Mekhi Brown, an Alabama commitment, might visit this weekend, Loy said. Class of 2015 running back Nick Brossette, an LSU verbal commitment, is scheduled to visit Notre Dame next weekend when the Irish host North Carolina, Loy said. Loy said the Irish also are expected to welcome a handful of class of 2016 prospects this weekend, including offensive tackle Tommy Kraemer (No. 18 overall), tight end Jake Hausmann (No. 69 overall) and receiver Austin Mack (No. 96 overall). In all three cases, the Irish are definitely in the mix, Loy said. Kraemer, Hausmann and Mack visited during the Michigan weekend in early September. [email protected] and tell him The Observer sent you.